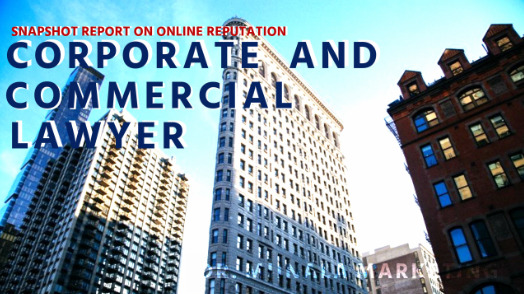 Dr. Miinala Marketing has announced a free report for corporate and commercial lawyers that is designed to help them increase their business. The snapshot report is designed to help the lawyers to reach more clients and market their services effectively. "Our aim is to provide solutions that assist businesses, both online and offline to reach more clients and boost traffic to their websites," says a spokesperson for Dr. Miinala Marketing. "We do this through a number of specific services." The company includes a staff of skilled marketing experts as well as SEO professionals, graphic designers and website developers. The company states that they can handle virtually any online marketing need, and that the free snapshot report offered to attorneys will help to show them where they are failing in their current marketing efforts. The company urges those interested in connecting with them on the Dr. Miinala Marketing Facebook page, where more information can be found and where interested attorneys can connect with others who have used the company's services. "We take every step to ensure your complete satisfaction," says the company spokesperson. "We can identify the problem in your current marketing campaign and then design and execute a new system that will provide better results than you could imagine." The team at Dr. Miinala Marketing maintains a positive reputation in online marketing and consultancy in a number of industries. Their products and services are designed to help attorneys to better their firm's reputation as well as entice new clients through their doors. The company states that they can assist with marketing in ways that most attorneys are not aware exist. In addition to offering a free evaluation of an attorney's website, the team also provides social media marketing to help clients reach higher numbers of people on a more personal level. They provide search engine optimization that helps customers to see their websites become more popular and thus, more populated, and offer advanced web analysis to assist with finding where current marketing solutions are failing. The company states that they are ready to assist any corporate and commercial lawyer with his or her business and urge those interested in learning more can be found on their official LinkedIn business page.